Thoughtshower: How Feasible is 100% Renewable Energy? Scotland by 2020, Australia by 2030, Denmark by 2050 – these countries are all aiming to produce 100% of their energy from entirely renewable sources. Smaller countries such as Iceland and Lesotho are practically doing so already. This year saw the first international conference focused on 100% renewable energy targets – so can the rest of the world catch up? By simultaneously cutting energy use and maximising domestic power sources, WWF and Ecofys say that the EU could have a “100% renewably powered energy system by 2050 at the latest.” Stanford researchers Jacobson & Delucci believe that the world could be entirely powered by wind, water and sunlight by 2050. So what are the obstacles to reaching this target? Some argue that a distorted risk perception of energy issues - such as short-termist views on initial cost - means that ambition and political will is low in some quarters. However, a lack of investment in technological innovation is also a problematic issue. Environmental philanthropist Jeremy Grantham recently called energy storage “the Holy Grail of environmental progress” because in order for the world to be powered entirely by renewables, the capacity to store its output needs to be improved. 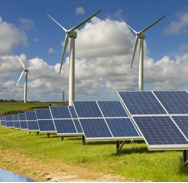 Renewable energy generation has grown exponentially in the last decade, beyond many people’s expectations. Nevertheless, the ambitious transition to 100% renewables – by 2050 or otherwise – will not happen unless both political and technological barriers are acknowledged.